This weeks skin care tip might seem a little strange but as strange as this may be...it works! 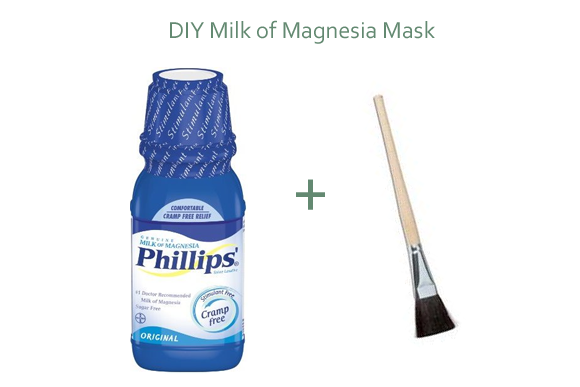 I recently heard about Milk of Magnesia as a topical mask from a fellow esthetician friend of mine. She has beautiful skin and told me she used it when pregnant to help reduce the extra oil and congestion she was having. I am having the same issues so I rushed to Target to pick up a little bottle. This has been a serious skin saver...not only on my face but I have been applying it on these annoying little bumps on my arms that I only get while pregnant and it has been drying and clearing them up! What is Milk of Magnesia: It is a liquid saline laxative. When taken orally it works by drawing water out of the colon. How it benefits oily skin: It works the same way as a clay mask and draws out excess oil of the skin. Milk of Magnesia is a little bit more gentle than clay and a great option if you are more on the sensitive side. Shake bottle before starting to make sure all of the active ingredients are mixed together. Pour about 1 tbs of Milk of Magnesia into a small container. Apply to face (chest or back) with a cotton pad or a facial brush. Leave on for 20 minutes and remove using lukewarm water and a soft washcloth. Make sure you follow up with a light moisturizer. *This mask is only recommend for oily/acneic skin. Do not use if you have dry skin. You can find Milk of Magnesia at your local drug store. I only recommend using the original non-flavored formula. Depending on how oily your skin is you can do this 1-4 times per week. I am breaking out ALL OVER THE PLACE and it's not cute... I might just have to try this one! DUDE! I totally get those little bumps on my upper arms. They're so annoying! I'm going to go get some of MoM after work today. VERY interesting idea! Clay has always been too rough for me! Who knew milk of mag could benefit your skin?! I'm having dry skin issues right now so this really isn't for me but so interesting! That is so interesting! What a great idea! And we have some of that around my house, score! Awesome. Thanks for sharing. I will totally give this a try. Thanks for the tip, I would have never thought of it! Had no clue this was good for your skin too! I tried this a couple times when I was younger. I can't remember if it ended up helping my skin or not but it was neat! Thanks, I've been wanting to do a mask, but afraid that it will bother my sensitive skin! So, I'll give this a try! I love this tip and can hardly wait to try it on my skin! Hey, so I know you've talked about being diabetic, and I just received some interesting new treats that I reviewed for my blog, and they claim to be perfect for diabetics because they only have 40 calories each and 2 net carbs and supposedly do not mess with your blood glucose levels at all! Thought you'd think this review and giveaway was worth a look! Okay, I need to try this. I have THE worst skin ever--it's both dry and oily. Ugh! Your blog is great! Thanks for all the amazing tips. I was wondering what you meant by a "facial brush?" Are these different from makeup brushes or paint brushes, or would something like those work as well? Thanks! Katie- You can find a soft facial brush at your local beauty supply store...or a soft(clean) makeup brush will also work great. Okay friend... never knew this was a beauty product! Haha! You're just awesome! Love you!! Ashley- I believe it is Keratosis Pilaris. It's so strange though because they only pop up when I am pregnant. There is a TON of home remedies you can do for them but this has really been helping clear them up. Who would have thought?! How cool! This is incredible...goodness, I wish I knew about it when I was pregnant...tip for the next time? But why wait!! :) I'll be trying this diy for sure! Say what???? This is the best thing I've heard today. Now need to get me some! I would love a post on how to get rid of the bumps! My dr said they were keratosis pilaris, and I have had them since I was a kid (I even have them on my cheeks). I'm 22 now and he said they should go away as I get older, but I'm still waiting for the day they disappear! I would love a post on remedies for them! This sounds like something I should try!! Maybe I'll just take a "mud bath" in this stuff! I'm almost 60. We used to do this years ago. When I was in my 20's, this was 'the' mask to use. It works great!